Cindy Wu is running for DCCC, 17th Assembly District. Here are the Bay Guardian endorsements for Democratic County Central Committee, 2016. The race for Democratic County Central Committee, often a second thought on the June ballot, is now a big deal, a proxy for the defining struggle to save what’s left of San Francisco from corporate power and real-estate greed. The DCCC sets policy for the local party. A lot of times that means passing resolutions that don’t have immediate policy impacts. In the best of times, it means registering voters, building a more progressive party structure. But right now, what’s at stake is the party’s endorsement in the November supervisorial races. Control of the city is up for grabs – the six seats on the board that are on the ballot will determine whether the mayor and the tech moguls can dominate city politics for the next two years, or whether the rest of us have a fighting chance. There are, to be blunt, two sides in this race. We know that some candidates want to appeal to everyone, to say they are “independent” or “moderate” or somewhere in the middle of the battleground. But at a time of crisis – and anyone who thinks this city isn’t in crisis isn’t paying attention – there is, for better or for worse, no room in the middle. Either you are on the side of the evictors, the developers, the landlords, Airbnb, and the one percent – or you think that it’s unacceptable for the chair of the Democratic Party of San Francisco to be a lobbyist for the Board of Realtors. So there are, in essence, two slates for the DCCC. One is made up of the supporters of Mary Jung, the landlord lobbyist who is the current chair. The other includes people who have promised two things: They will vote to replace Jung with a progressive (Sup. 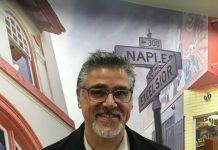 David Campos is our first choice) – and they will support the progressive candidates for supervisor this fall. The candidates on the Reform Slate have vowed that they will not back the candidates of the mayor, Ron Conway, and the power structure under any circumstances. There are people on the Reform Slate who might not be our first choices. Bevan Dufty was the supervisor who swung to vote to put Mayor Lee in office, and the city has been terribly damaged by that decision. 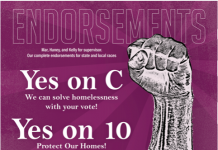 But he has seen that damage first-hand as the city’s homeless coordinator, and is now standing with the left in this race. We were not always in agreement with Sophie Maxwell when she was on the board. And there’s a strange twist – after the progressives spent months finding a broad-based diverse slate, John Burton, the former state Senate president and chair of the state Party, decided to run. That might be good news if he is part of the progressive slate, since he will almost certainly win, and Burton has been a liberal legend in Sacramento, but on local issues, he has a much more mixed record. This race is so important that both sides have scrambled to get high-profile candidates. Name recognition is critical when the voters look at choosing 14 people on the East Side and 10 on the West Side, and nine of the 11 members of the Board of Supes have filed to run. Two School Board members are on the ballot, and one Community College Board member. Angela Alioto, former supe and daughter of a mayor, is running. Tom Hsieh, Sr., who was one of the most conservative people to serve on the Board of Supes in the past 30 years, is on the ballot. There are arguments for lots of different candidates, but in the end, this is a classic battle of Us Against Them. The Reform slate will kick the Board of Realtors out of the chair of the Democratic Party and ensure that the DCCC helps progressives win in the fall. The Real Estate Slate will keep things the way they are – which is, frankly, unacceptable. So here are the Bay Guardian endorsements. Everyone on this slate has promised to replace Jung as chair and to support the progressives for supervisor. We expect that most of the progressive groups in town will be offering a similar slate. It’s our best hope for the first round in the next fight for the soul of the city. There are 10 seats up in this part of town. So far, only seven have met our criteria. If others decide to commit to supporting the Reform agenda, we will add them in for our final endorsements in late May, before the absentee ballots drop. The better and cheaper ( meaning less campaign ie influence money involvement) would be to register to vote as NO PARTY because in California you do not need to register as a Democrat to get a Democrat ballot. Then completely ignore anything the DCCC puts out. Catch a clue people. Interestingly, the only candidate who articulates the fullest counter to the real estate interests is not on your roster. David Giesen–that’s me–is a land rent communist. He makes a moral and scientific argument for socializing the full rent potential of land. He will support that legislation which comes closest to realizing that perspective, and will denounce legislation which takes us away from that perspective. Hey Tim , when is the City going to audit your affordable housing buddies? How many “affordable” units have they constructed with the hundreds of millions extorted from developers? And it was great to see Billy Maher and Sue Hestor in the Comical last Friday. If Oceanwide’s tax increment wasn’t sorely needed by Transbay, they would really get slaughtered by your unaccountable affordable buddies. 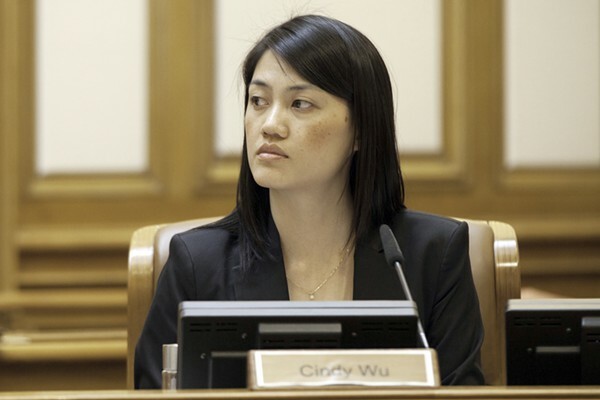 To say that I was a SF Supervisor and “daughter of “a mayor” is sexists and disrespectful. The Guardian has endorsed me in the mayors race and in the supervisors races….i was the leader in Sunshine and clearly, Public Power…not to mention all of the health, neighborhood, housing and homeless laws that were written…..I have never said that being the daughter of the mayor was a qualification and shame on you for saying it!!! Do you really think if i were a man who had done so many great laws you would have said that 1 out of 2 qualifications was who my father was…i don’t think so. Especially after years of support from the Guardian because of the amazing issues we fought and won together. Shame on you.